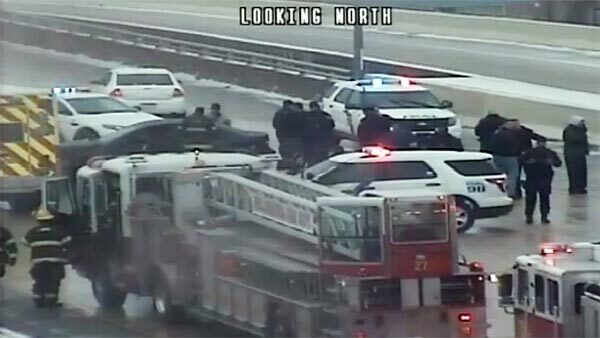 PHILADELPHIA (WPVI) -- Two police officers were taken to the hospital after a crash on Interstate 95. The crash happened as snow fell across the area on Wednesday morning. Philadelphia police say the officers were in a vehicle that spun out near the Washington Ave. exit and struck a guardrail. There was no word on the officers' exact conditions, though police say both were conscious when they were taken to the hospital. The view from a traffic camera showed a vehicle sideways on the roadway. At least one fire truck, an ambulance, and several police cars were on the scene.